It was 1892, on the wintry mud of Walker Field, that Utah Football made its inauspicious debut. Long before the National Football League, and back when touchdowns were only worth four points, that first team went 1-2, splitting games with the Salt Lake YMCA and losing to the Utah Agricultural College (now Utah State) in Logan. Fast forward 125 seasons (Utah Football did not play in 1893 nor in 1917, due to World War I) and the Utes have come a long way. They are 17-4 in NCAA bowl games, including two “BCS-busting” bowl wins (and undefeated seasons) in 2004 and 2008. Scores of those who have donned the U jersey on the gridiron have gone on to bigger and better things in the NFL, including 17 who have been named to a Pro Bowl, one No. 1 overall pick and one Pro Football Hall of Famer. In 2013, the 150,000-square-foot Spence and Cleone Eccles Football Center opened as one of the largest and most technologically advanced football facilities in the nation. 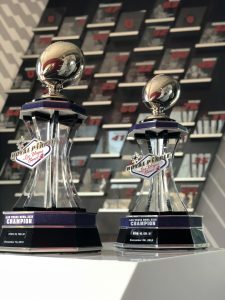 While the facility has helped the program recruit the elite student-athletes needed to compete and win in the Pac-12 Conference, it also serves as a museum where the rich history of Utah Football could be displayed for fans and the community to celebrate. 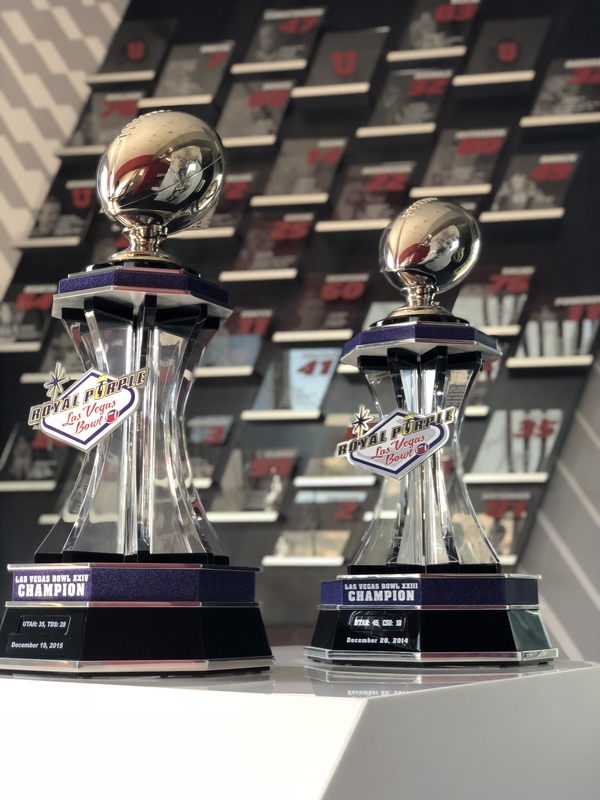 Trophies from past bowl championships, including the 2005 Fiesta Bowl and 2009 Sugar Bowl, are out in the open in the facility’s hall of fame for the public to appreciate. Also on display are individual honors like the Morris Trophy (awarded to the best offensive and defensive lineman in the Pac-12) won by Star Lotulelei (2011), Nate Orchard (2014) and Isaac Asiata (2016), and the Mountain West Conference Defensive Player of the Year Award won by Eric Weddle in 2005. And of course, there’s the wall of fame, where currently 38 players are recognized for their accomplished college football careers. And it’s the first thing recruits see when they visit the Eccles Football Center. His real name was Carl Robinson, but his football nickname was “Meatnose.” Like all the other players in the 1940s, Robinson wore leather shoulder pads and a leather helmet. And like today’s Utes, Robinson and his teammates gave it their all. 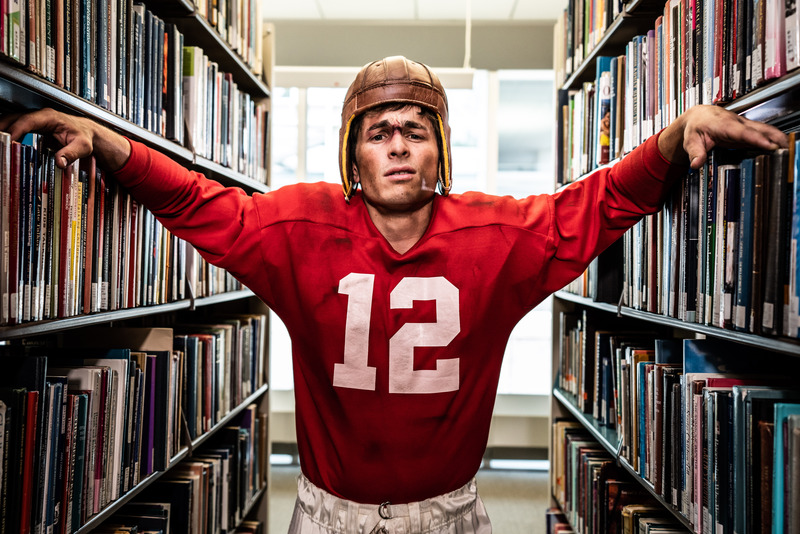 At the kickoff game last week against Weber State, the Marriott Library’s historic football collection was highlighted. While Utah Football is celebrating 125 seasons, the Marriott Library celebrates 50 years, with photographs, game programs, films and yearbooks dating back to the Utes’ very first game in 1893. Check out our online gallery and visit our Special Collections on level 4 of the library where you can see these treasures firsthand. For more information, call 801-581-8863 or visit the Special Collections website.